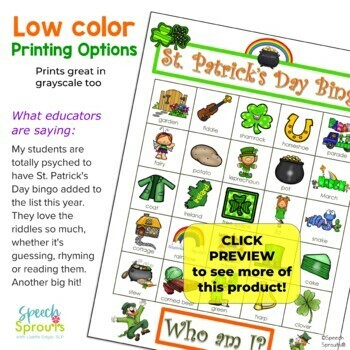 A St. Patricks Day speech therapy bingo game that's extraordinarily fun! 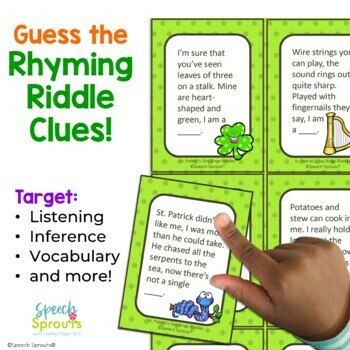 Your students will love guessing the rhyming riddles for your classroom party too. Target speech and language with listening comprehension, inference and vocabulary for a whole-class spring activity or use just a few boards for small groups. "The Best Bingo Game on TpT" is just one sweet comment I have received on my best-selling Bingo Riddles Games! They help me cover any size group with multiple language and therapy goals and are terrific for in-class therapy too. After playing the game, students write their own riddles and have fun taking turns guessing the answers. 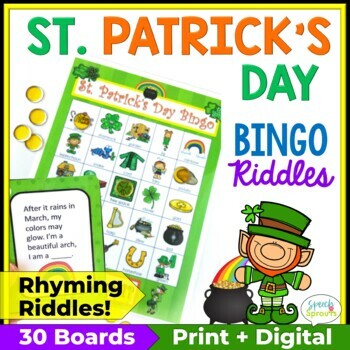 My bingo riddles games are terrific for a wide variety of ages. Includes suggestions on how to level the game for preschool through sixth grade. •	Riddle Me! Write Your Own Riddle- Printable Extension Activity. You may also enjoy the following products. Just click the green text to see more.